KT and I picked up a prehung french door unit on Friday after work. We saw 5′ and a 6′ wide doors. To save some wall space, we decided to get the 5′ wide doors. We rented a Lowes truck to transport it home and our very kind neighbor dashed out to give us a hand bringing it in the house.My dad worked really fast and I had to snap pictures whenever I saw an opportunity.We’re putting in the french door at the center of this gray wall. To prep, we sectioned off this room with drop clothes to try to keep the dust in a smaller area. We put down a heavy duty drop cloth on the floor and covered it with cardboard to protect our new painted floors. I missed some steps when I had to run to the store to pick up some needed materials but this is what I was able to learn from observing. 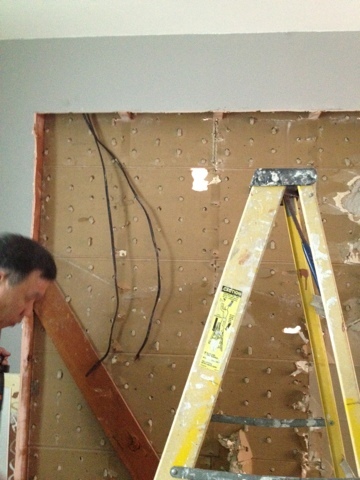 First, we (meaning my dad) put some holes in the wall to locate the studs. 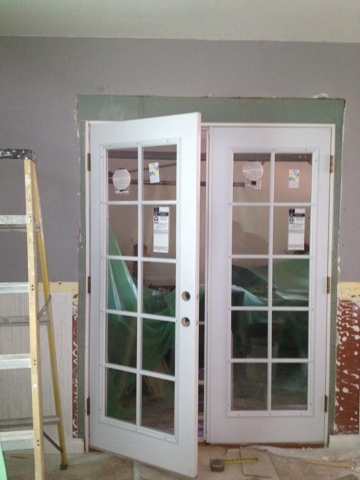 The frame of the doors will need to be nailed between two studs to hold the door up. We ended up shifting the door a little to the left due to the placements of the studs. 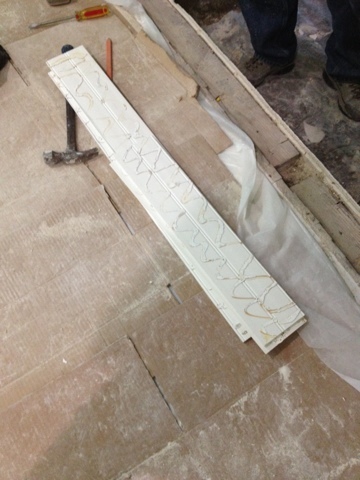 Once its marked out where the door will go, the bead boards were pulled out. Blurry picture alert – I didn’t have time to check my pictures. 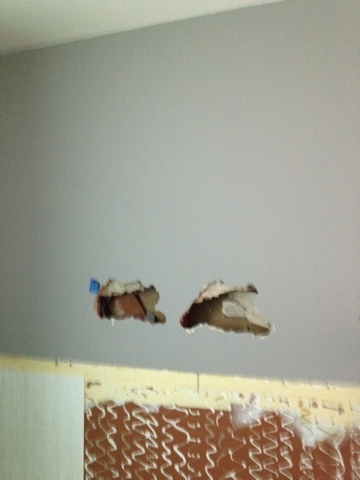 Then the drywall was knocked out and the studs in the middle were cut out. We were real eager to get the door in but we’re not quite there yet. The bottom of the doorway is not flushed with the floor in the living room so some bead boards were cut and reused to raised the doorway to the right height. Hooray to reusing materials! The doors went in next. Here’s actually the hard part – trying to get the doors leveled from all sides with wood shims. This is so so important because we get sticky doors when they’re not leveled. Oh, can’t forget – the door frame also needs to be flushed with the adjacent walls so that when we patch up the wall, it will be seamless. 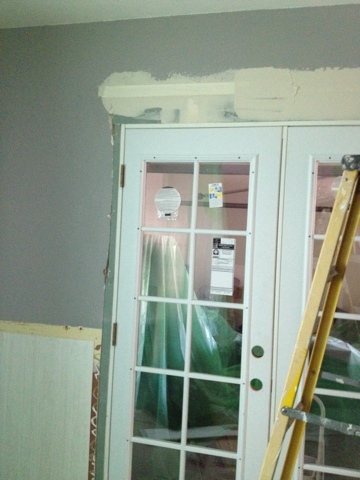 This process of adjusting the doors took the longest. About two and a half hours. 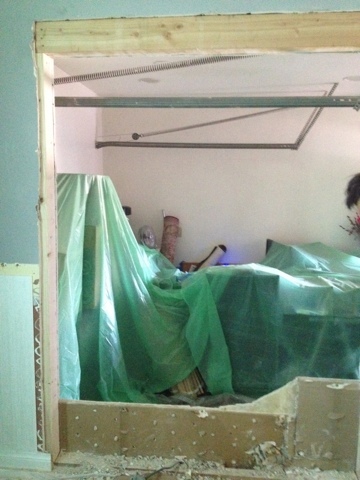 Once everything was leveled, the door frame was nailed to the 2x4s and the 4×6. I was hoping we can just put door trims around the door and not have to patch up the wall. Hehe. Yea I know, we can’t do that. My parents came back on Sunday with some drywall. It was fitted to the gaps between the door frame and the walls. 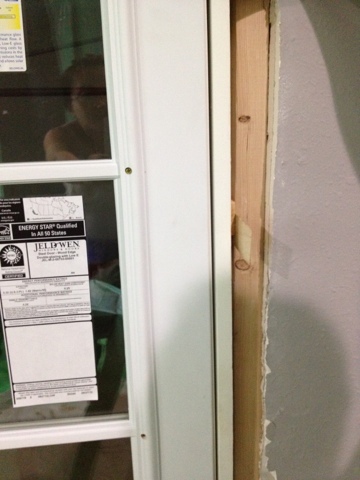 Joint tape was used to seal the seam between the drywall and the existing wall around the door. Then the joint compound was used to cover up the tape and any blemishes. Now we just have to wait for the first coat to dry so we can add another layer of the joint compound. 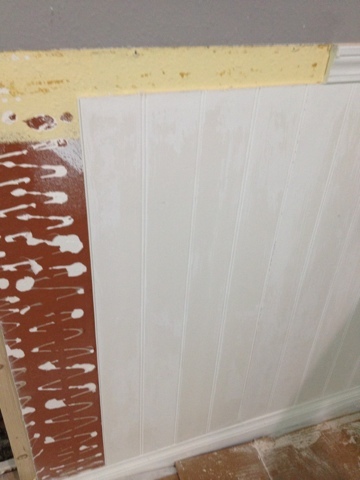 Hopefully with two coats, all blemishes will be covered up and then we can sand and paint. Hopefully by next weekend we can post the finished product. 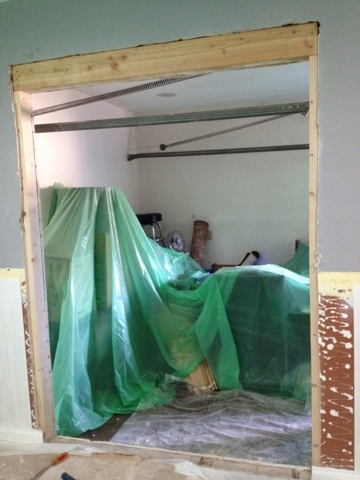 This entry was posted in Living Room, Weekly Progress and tagged how to install french doors. ← Look What We Found – Animals In the House!